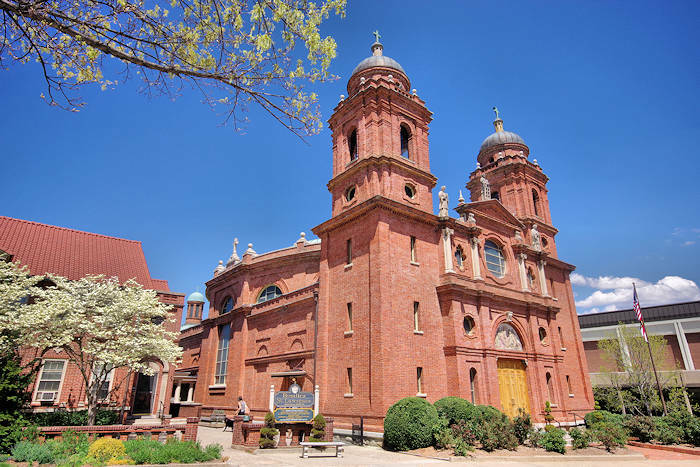 Completed in 1909, the Basilica of St. Lawrence D.M. 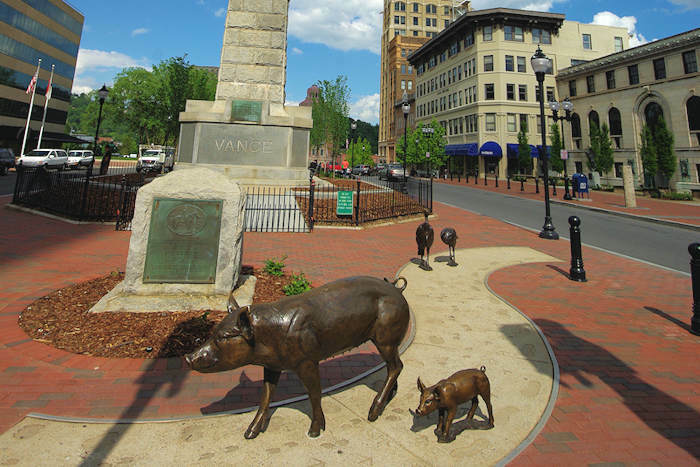 is one of Asheville's architectural treasures and spiritual anchors. 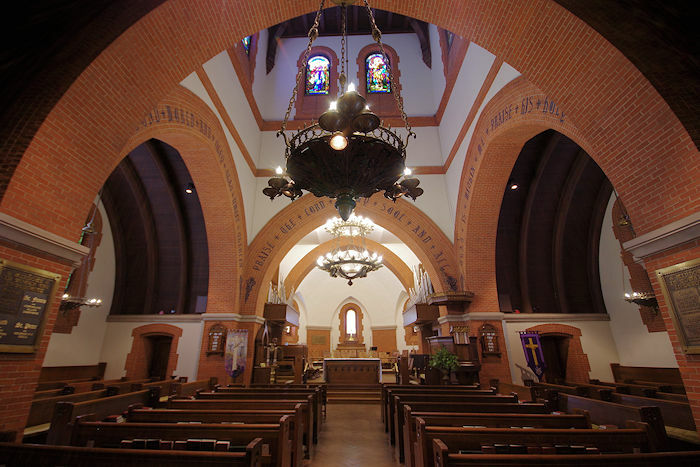 Designed by Rafael Gustavino and Richard Sharpe Smith, renowned architects on the Biltmore House, this Catholic church has the largest freestanding elliptical dome in the country. 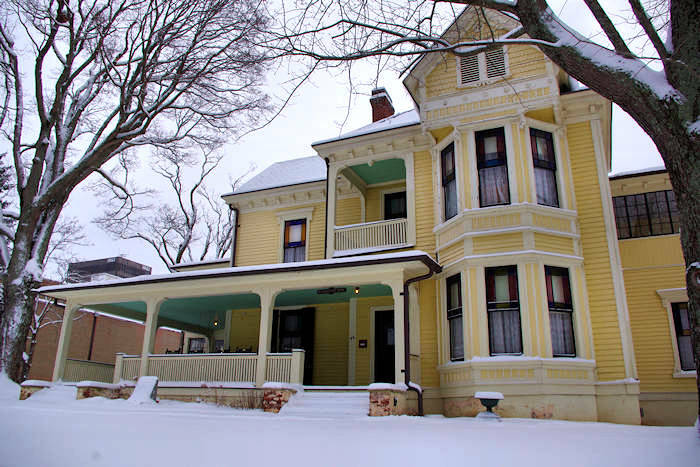 Located at 97 Haywood Street in downtown Asheville, it is open daily from 7:30 AM to 5 PM on weekdays for visits. 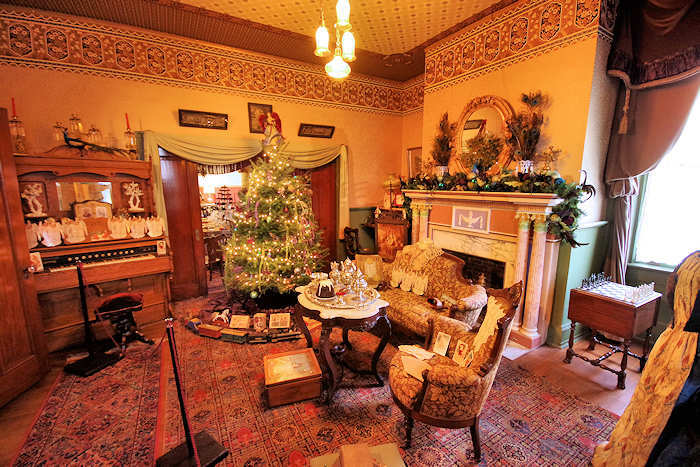 Take a self guided tour (printed below) or schedule a complimentary guided tour in advance via a form on their website. It's just around the corner from the Grove Arcade! Mass times are Saturday 7:30 AM and 5 PM and Sunday 9 AM and 12 Noon. Spanish Mass is Sunday at 5 PM. Weekday mass is Monday-Friday 7:30 AM and 12 Noon. The style, chosen by the architect, is Spanish Renaissance. The central figure on the main façade is that of St. Lawrence holding in one hand a palm frond and in the other a gridiron, the instrument of his torture. On the left of St. Lawrence is the statue of St.Stephen, the first martyr, and like St. Lawrence, a deacon; while to the right is the statue of St. Aloysius Gonzaga, a native of Spain as was St. Lawrence. The lunette over the main entrance is in polychrome terra cotta and represents Christ giving Peter the keys and appointing him head of the church. Immediately below this lunette is a stained glass window displaying the Basilica of St. Lawrence Coat of Arms. The massive stone foundations and the solid brick super structure give silent testimony to the architect’s desire to build an edifice that would endure for generations. There are not beams of wood or steel in the entire structure; all walls, floors, ceilings and pillars are of tile or other masonry materials. The roof is of tile with a copper covering. Entering the vestibule, which is separated from the church proper by screens of leather and stained glass, one notes the solidity of the structure; the very steps to the organ left are without wood or nails. The vestibule window to the right is Bishop Haid’s coat of arms; the one to the left is the coat of arms of Pope St. Pius X. From the foot of the main aisle, inside the church proper, one can realize the beauty of the ellipse and the wonder of the dome. It has a clear span of 58 x 82 feet and is reputed to be the largest freestanding elliptical dome in North America. The four statues in the wall niches are from the Daprato Statuary Company, Italy. On the left, St. Cecilia and St. Peter; on the right, St. Rose of Lima and St. Patrick. 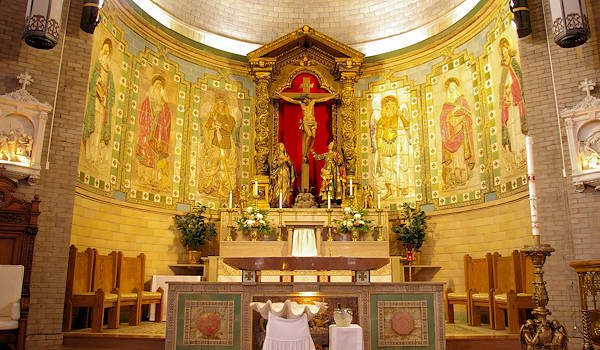 The visitor’s next point of focus, at the head of the center aisle, is the main altar and the Crucifixion tableaux above. This group is rare and fine example of Spanish wood carving of the middle seventeenth century, and represents Mary, the Mother Jesus, and St. John, at the Crucifixion. The fresco of the Last Supper and the flanking square panels made up the lower facade of the main altar until 1968. At that time they were separated from the base of the altar, moved forward and topped with a 1,800-pound block of Tennessee marble to form a new altar table. The ornamental partitions that fill the entire apse wall above the altar are made of polychrome terra cotta. Two archangels, St. Raphael (with the fish in his right hand and a sword in his left) and St. Michael (grasping a sword in both hands), stand on either side of the altar. To the left of St. Michael are the evangelists Matthew and Mark; to the right of St. Raphael-Luke and John. The evangelists’ symbols are at their feet; the angel for St. Matthew, lion for St. Mark, bull for St. Luke, and eagle for St. John. The figures are more than seven feet high; the partitions on each side measure 11 feet by 18 feet in length. To the left of the main altar is the Chapel of Our Lady. The white marble statue depicts Our Lady of the Assumption. Inserted in the upper part of the altar is a panel entitled The Crucifixion, which is attributed to an old renowned pottery in Capo di Monte, Italy. On either side of the tabernacle are niches containing statues of the following from the extreme left. Ss. Margaret, Lucia, Cecilia, Catherine of Alexandria, Barbara, Agnes, Agatha, Rose of Lima. Forming a frame around the altar front is a series of tiles lettered with the namesof Our Lady selected from the Litany of the Blessed Virgin. In the center is a fragment of Italian marble depicting the Nativity. Arching over the altar are seven doves, which represent the seven gifts of the Holy Spirit. The large stained glass window is St. Mary of the Sea; the small one above is St. Raphael, the archangel. The ornately carved door to the sacristy is of Spanish design and is dominated by the theme of the Good Shepard; on the scroll is the Latin, Pastor Bonus. Above the door is a 17th century painting of the Visitation. The artist is thought to beMassimo Stanzione (1585-1656). On the walls of the chapel are icons of the Blessed Lady as: Our Lady of Czestochowa, Our Lady of Perpetual Help, Virgin Mary of Guadalupe, and the Annunciation. At the rear of the chapel is the crypt of the architect, Signor Rafael Guastavino. The door is of lustre-glazed tiles framed in bronze. The lustre-glaze process was discovered by Rafael Guastavino, Jr. during ceramic experiments conducted at the Guastavino tile factory in Woburn, Massachusetts. To the right of the main altar is the chapel originally called St. Joseph’s. but it is now referred to as the Eucharistic. Adoration Chapel. Above the altar is a stained glass window of the Nativity. The large window on the east wall depicts the death of St. Joseph in the arms of Jesus and Mary.Both windows were taken from the old wooden church formerly on this site. The smaller window above on the right is of St. Lawrence. The altar and part of the apse wall are a mosaic of broken bits of tile assembled and inlaid by Fathers Peter and Patrick Marion priests in residence during the construction of the church. An appreciation of the windows and the full effect of the dome can best be viewed from the center aisle, immediately in front of the sanctuary, facing the rear of the church. Just under the vault of the dome is a frieze of ten semi-circular windows. On the west(right) wall, from the front of the church toward the rear, the scenes represented are:The Annunciation, The Visitation, The Nativity, The Child Jesus Teaching in the Temple,and the conversion of St. Paul. On the east (left) wall, from the rear are: the Marriage Feast at Cana, Raising to Life the Daughter of Jairus, The Calming of the Wind and Waves, The Agony in the Garden, and the appearance of the Risen Savior to Mary Magdalene. The two large windows represent Christ healing the afflicted (east) and The Transfiguration (west). In the organ loft, the large window portrays the Resurrection. To the lower right is a window which has as its subject St. Paul. The smaller one above commenorates the four Fathers of the early church, Sts. Jerome, Gregory, Ambrose and Augustine. To the lower left is a window with St. Peter as the subject. The one above it honors the four evangelists. All the windows, except those from the first church on the site and the Basilica coat of arms above the entrance doors, were made in Munich, Germany. The title dates back to the early Greek and Roman times and referred to a type of public building. In the 4th century, Basilicas began to be used as places of worship. It was during this time that construction of the greatest Basilicas of Rome was started. Today, the term Basilica is a special designation given by the Holy Father to certain churches because of their antiquity, dignity, historical importance or significance as a place of worship. 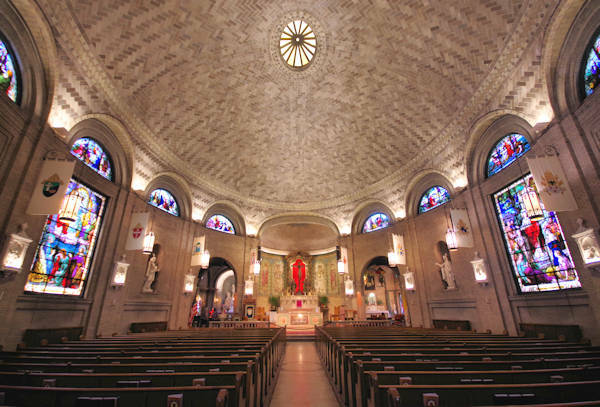 At the time of the designation of St. Lawrence (04/93) there were 33 other Basilicas in the United States. The church must have been consecrated; the liturgical rites (celebration of the Holy Eucharist, sacraments of penance and other sacraments) should be executed in an exemplary way with fidelity to liturgical norms, and the active participation of the people of God (parishioners). It should be large enough and the elements required for liturgical celebration (altar, pulpit, and celebrant’s chair) should conform to General Statutes of the Roman missal. It should have special significance in the diocese. St Lawrence,with its unique dome, is the only church designed and built by the renowned Rafael Guastavino; and is considered the mother church of western North Carolina.